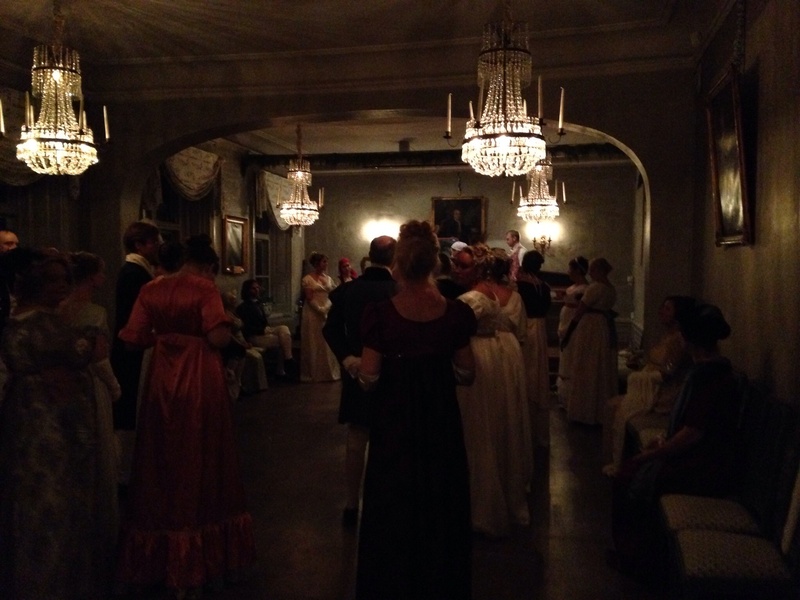 Last time I wrote about the upcoming Jane Austen exhibition. 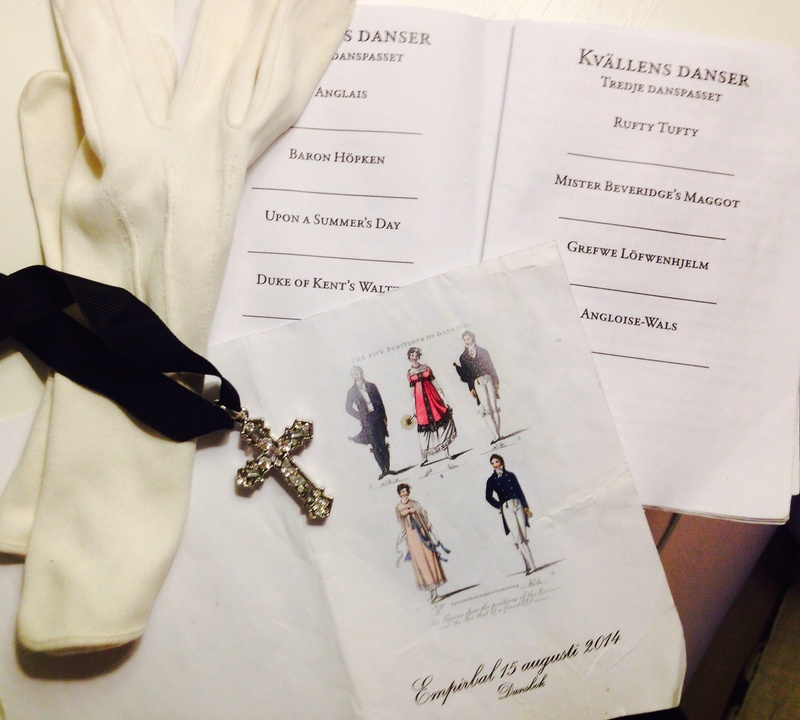 With less than three weeks to the opening, the Cosprop costumes are arriving tomorrow! It will of course focus on the famous film costumes, but they are supplemented with a handful of extant garments from our collections. 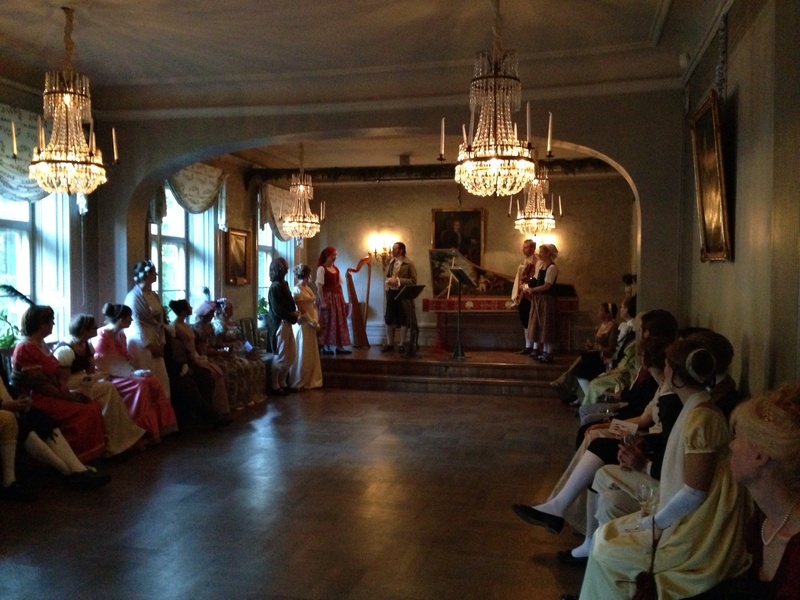 The fictional Mr Darcy, Mr Ferrars, and Colonel Brandon are sort of visiting Count Brahe, the real life owner of Skokloster Castle. There is plenty of remarkable textiles in the Skokloster Castle collections, such as clothing, bed hangings and tapestries. 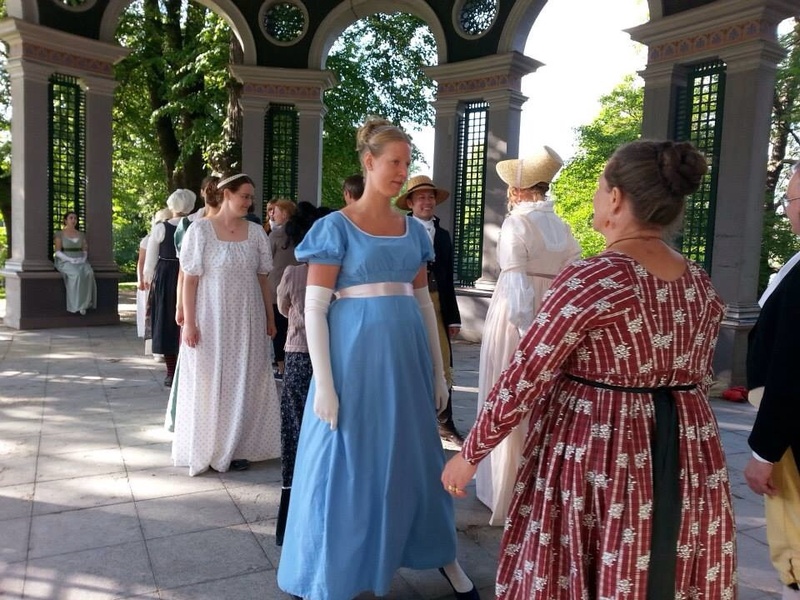 Most of them date back to the seventeenth century when the castle was built, but there are some very fine garments from later eras, and specifically from 1811, so no wonder that we take the opportunity to put them on display this summer. In 1811 His Excellency Count Magnus Fredrik Brahe was appointed Swedish envoy to the imperial court of Napoleon. 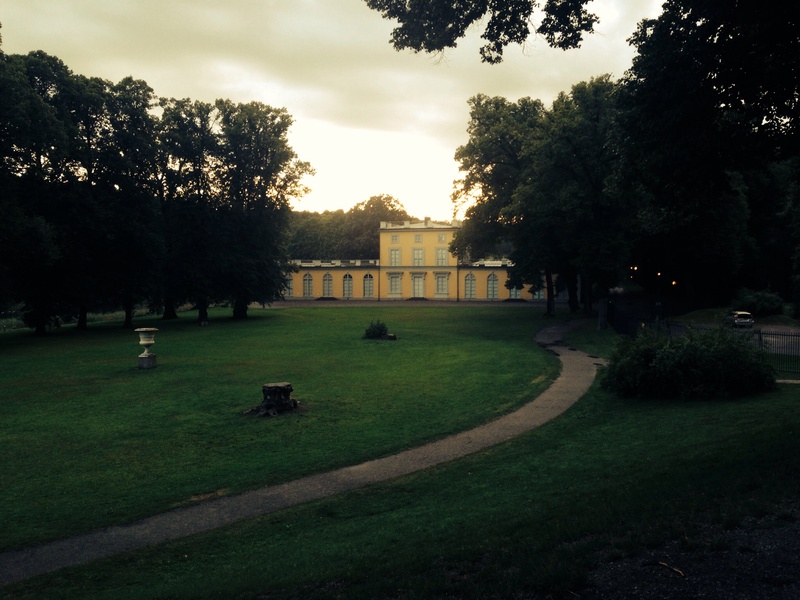 Count Brahe was the highest ranking aristocrat in Sweden. He held many honorary titles and a vast fortune was entailed to him. Nonetheless this meant a great expence to him. His entourage included the countess Brahe and his handsome twenty-year old son. The witty Countess Aurora Brahe charmed the French society and Napoleon named her “La Belle Suédoise”. In Paris the count ordered two formal suits à la Française for the celebration of the birth of the King of Rome, that is Napleon’s son, Napoleon. The baptism was held in Notre Dame on 9 June 1811. 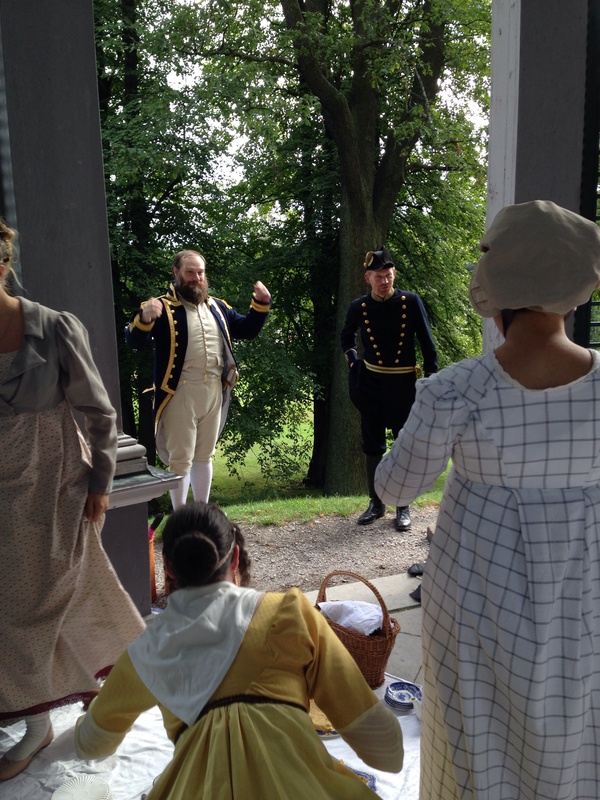 It was a grand affair, and as ambassador Brahe was required to wear court suit. Napoleon had revived the extravagant embroidered silk suits worn at court before the revolution. If the provenance was unknown these could easily have been made twenty years earlier. From the digital database: Count Brahe´s two court suits seen here with a livery probably worn by his valet to the same occasion. His Excellency, Count Magnus Fredrik Brahe (1754-1826). Painting by Carl von Breda, Skokloster Castle. Countess Aurora Wilhelmina Brahe, “La Belle Suédoise”. This miniature portrait was painted by Jean-Baptiste Augustin in Paris, 1811. Private collection. …are these stunning suits. This is the one in lavender grosgrain silk. 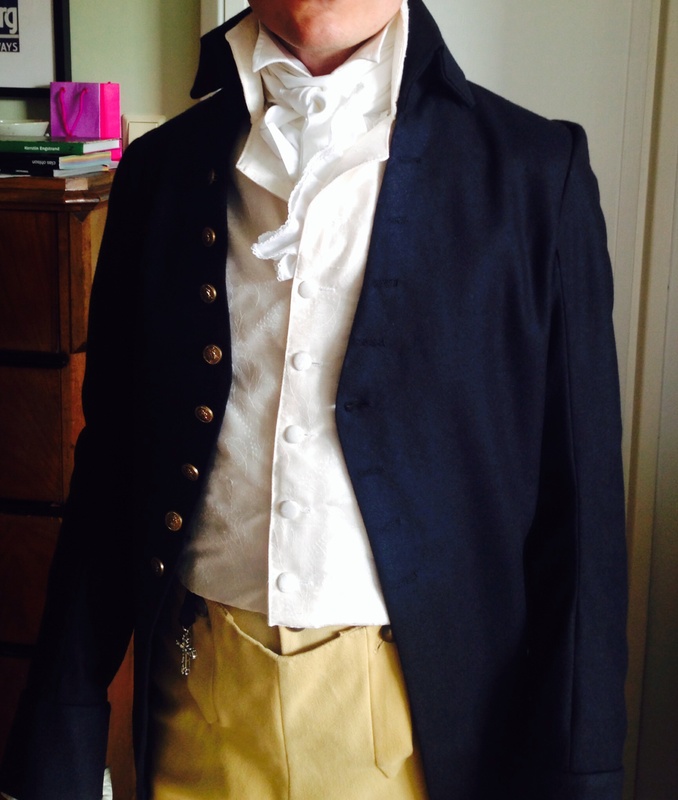 The tailcoat has nine decorative buttons down the front, and three working button holes. Inv no 11930, 11931, 11939. Link to the database here. The lavender suit. This is the most formal of the two with elaborate silk embroidery, including cording, silver spangles, and glass sequins. A closeup of the waistcoat. I discovered just now that some of the sequins have been lost. Interesting seams over the shoulders. This indicates that pre-embroidered sections were pieced together. Notice the cord and the button on the collar? This was either to hold a cloak or the ceremonial sword. Notice how the embroidered flowers are cut in half by the side seams? Let us take a look at the brown and green suit. Inv no 11945-11947. Link to collections database here. The embroidery is less formal, executed in silk thread only, without the glitter, but nonetheless very decorative. Interestingly the upper buttonholes on both coat and waistcoat are nonfunctional. Again the condition is remarkable, but the suit was probably only used on that one occasion. The silk is woven with small irregular dots. It is currently laid out on a large table. Could have been made yesterday. The breeches are green silk velvet. Buttons and embroidered kneeband. Unexpected use of gold thread and sequins, since there is nothing of the sort on coat and waistcoat. I wonder why? A glimpse of the inside. This is centre back. A string through one hole on each side of a gusset makes the waist adjustable. 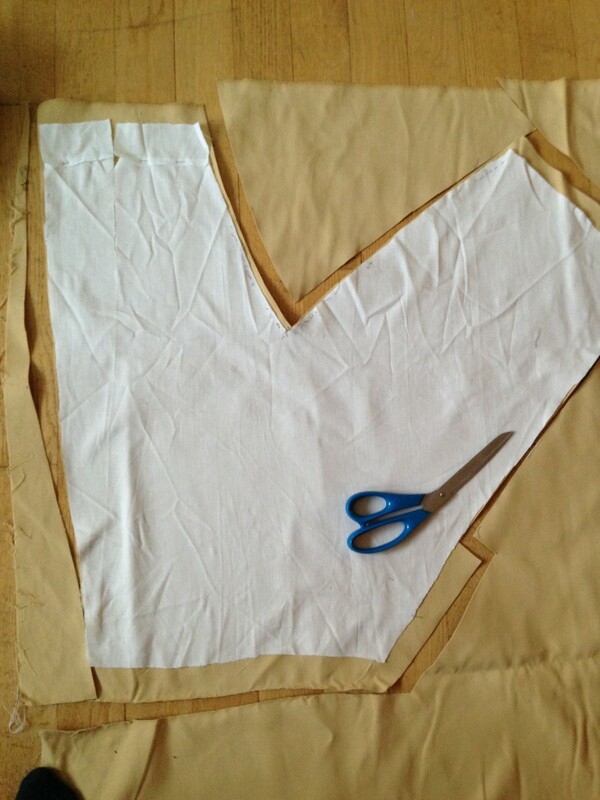 The garment is lined with a fine linen, Surprisingly, white linen is used on the waistband. The white silk satin waiscoat. The collar is about 80 mm high. These waistcoats came as a “waist shape”, a pre-embroidered length of silk that was cut and assembled by ones tailor. The emboidery was designed “à la disposition” and was easier to carry out on flat silk instead of a garment. A Waistcoat shape, Victoria & Albert Museum. Silk intended for a coat. Notice the embroidered circles that would cover the buttons? The Metropolitan Museum. These suits are a testament to the skilled embroiderers who created such incredible work. Sadly there is no record of receipts or labels so their names are lost to us. 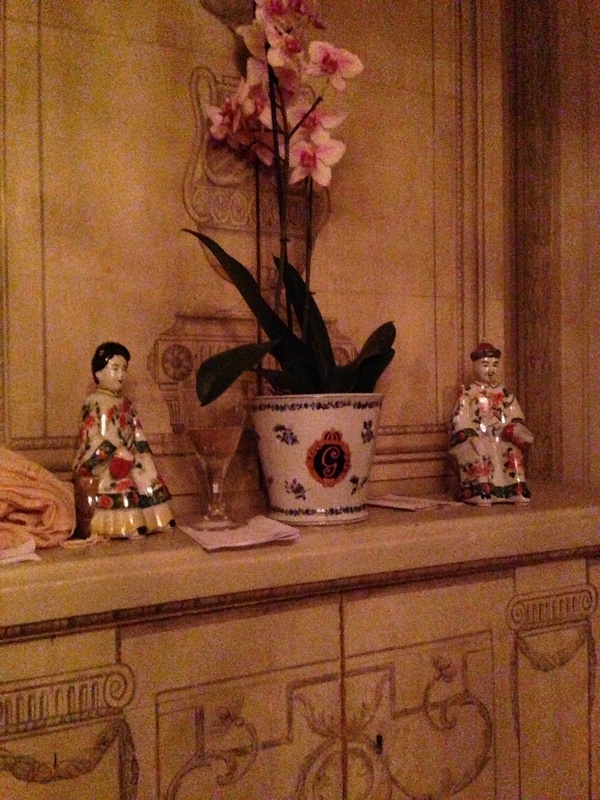 They also evoke Napoleonic imperial splendour and aristocratic duties during the early nineteenth century. They will no doubt make a contrast to the no-nonsense Austen gentlemen. Only one week to go before the glorius Stockholm Empire Days of 2016! My summer was oh so busy, going places, so I had no plans to make anything new this year. 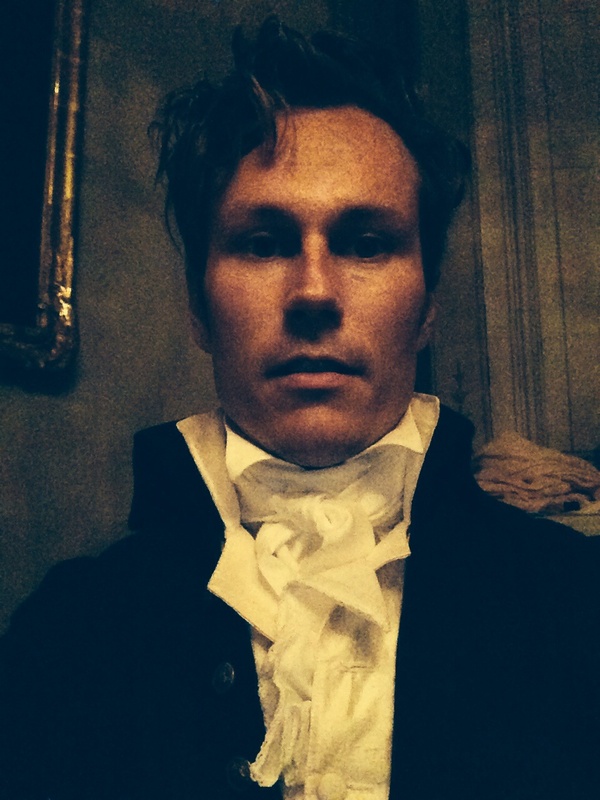 Before the summer I made the striped waistcoat that hasn´t yet been out in public, and I could have settled with that. 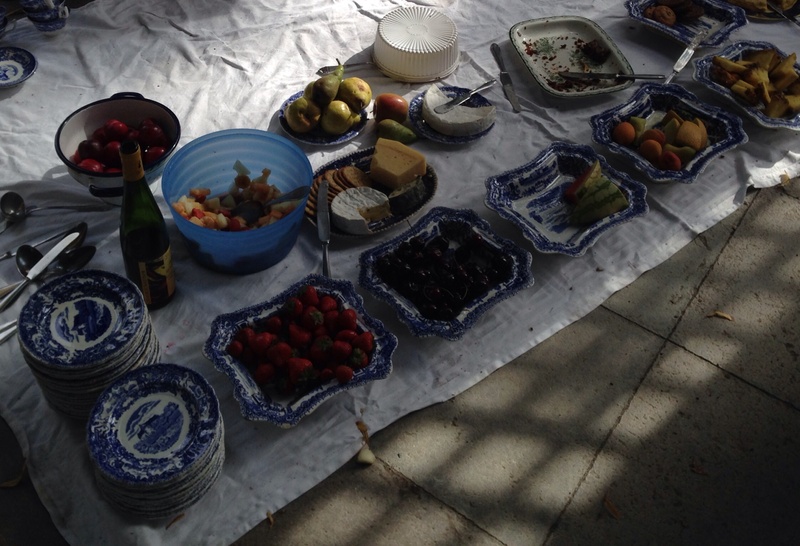 But then I thought: Why not make pair of breezy linen trousers for one of the picnics? The decision was made the moment I found some perfect linen in the stash. Luckily there was (just) enough of it. Cutting the required pieces. 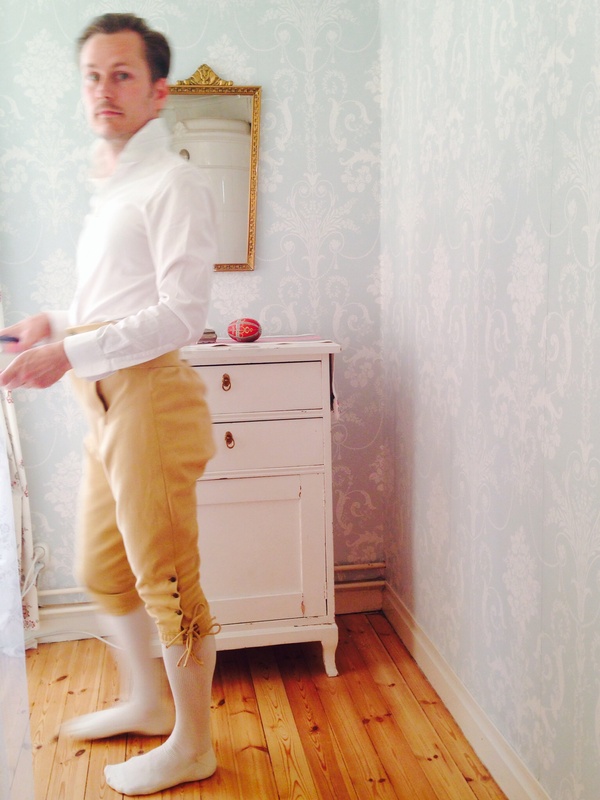 I measured my legs and googled patterns on Regency trousers for a quick reference. Later that evening I went online to do some additional research/find inspiration. And changed my plans. Why not pantaloons? As seen in Costume Parisien 1800-1806. 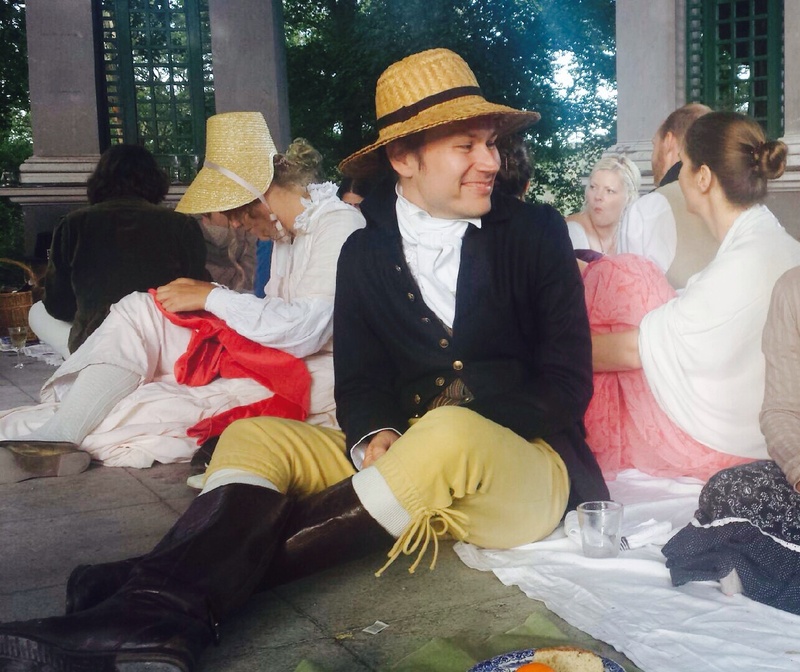 Costume Negligé is perfect attire for a picnic. One should avoid going overdressed for al fresco dining. (And I naturally chose to ignore the “TRÈS Jeune Homme“…) And what a relief to replace the warm boots with white socks and shoes (or in my case the opera pumps). 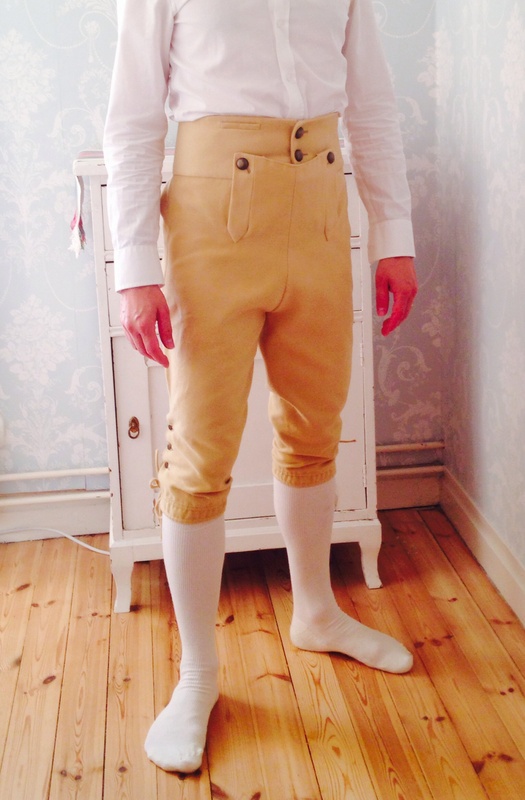 Trousers came in all shapes during the Regency, from very loose fitting ones to the extremely tailored pantaloons that hugged one’s legs like a second skin. They could be made in cotton, wool, linen, or stretchy knitted material. Sometimes these different types of trousers and pantaloons were very long. They could have straps that went under the shoe to keep the fabric stretched. Sometimes they ended somewhere mid-calf. Sometimes they were really full around the waist (“cosacks”). 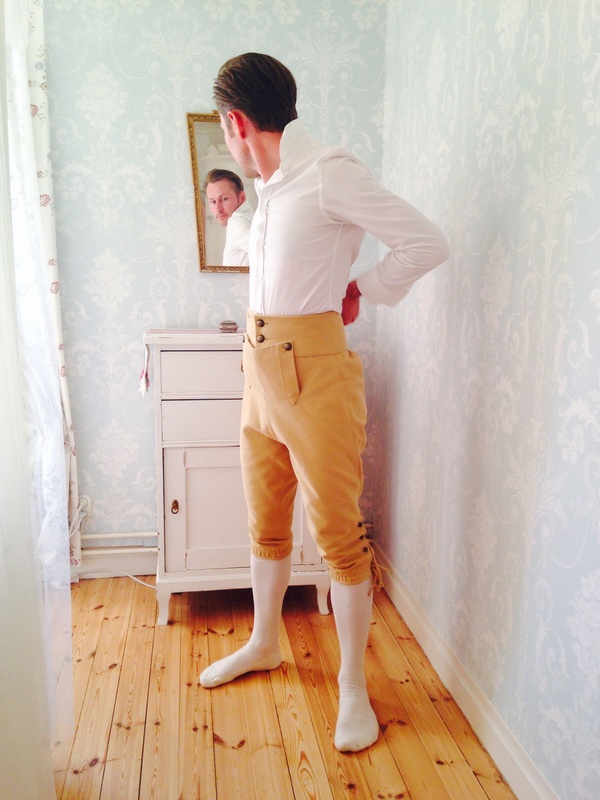 And let us not forget that breeches were still very common, not only for formal attire. 1806: Very long pantaloons disappearing into the shoes. 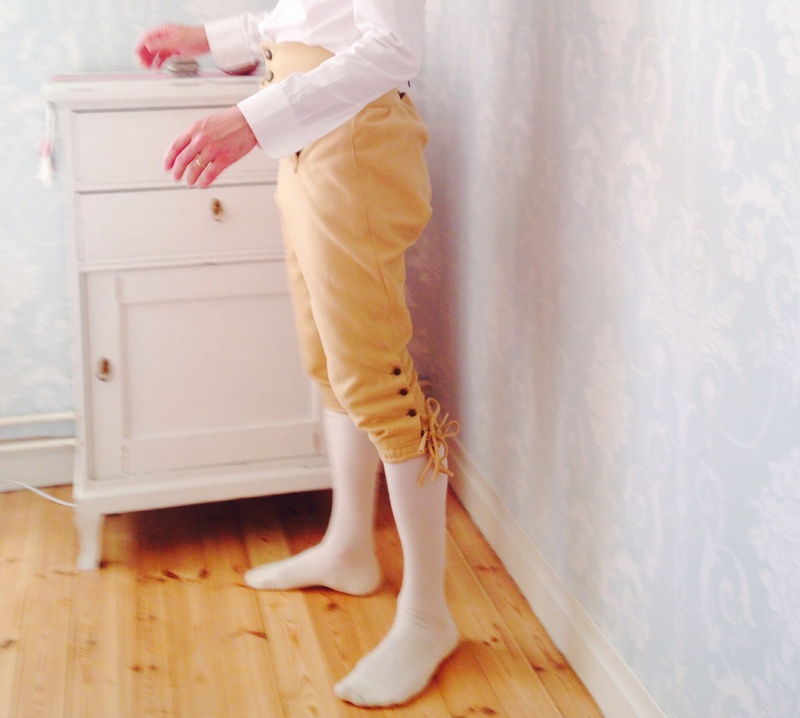 Again 1806, but these trousers, and the ones below, are ankle lenght. Notice how well fitted they are over the legs, but more loose over the thighs and around the waist? These extant pantaloons from the MET show us the trick: the fabric was sewn in the shape of the leg. See? And they also reveal the baggy behind. Why? More on that in a minute. Linen pantaloons, The Metropolitan Museum. First fitting. Trying out the legs. How tight dare I go? Stitching centre back seam. Then I removed the orange basting. Then I realised the linen was revealing so I rustled up some gauzy cotton to line the entire garment. This is where the self-covered buttons will go. The fall and fall bearers are nearly done. 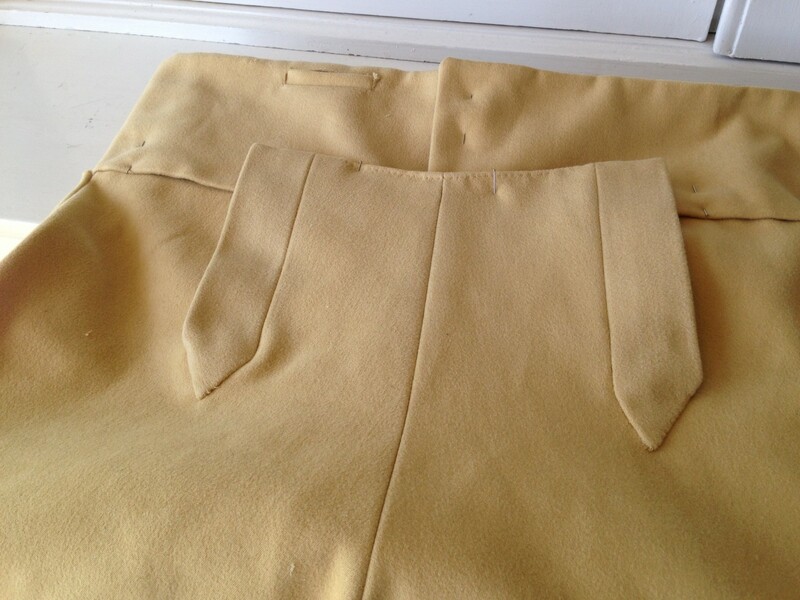 The back is gathered to the waistband. Adjustable tape at centre back. 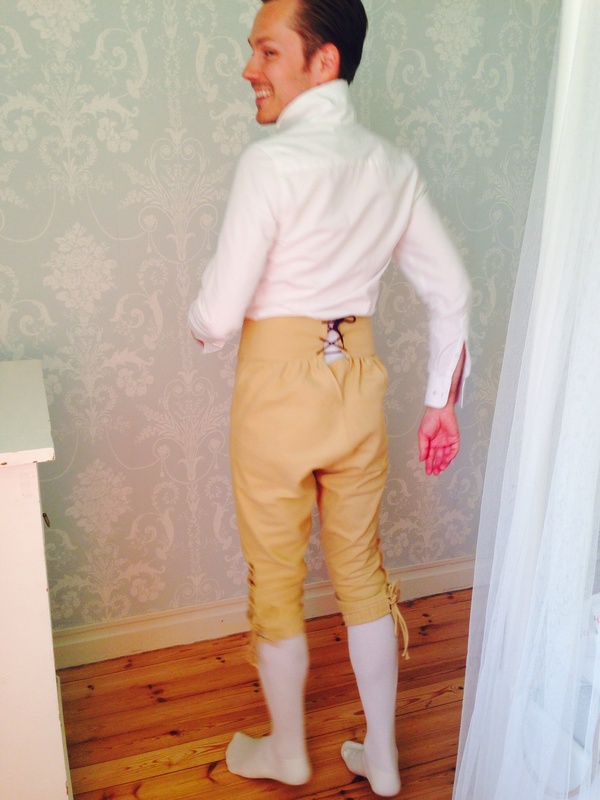 And the back looks like this when wearing the pantaloons. Very baggy seat compared to the legs. So different from modern trousers! Without all that extra material it wouldn´t be possible to do this, since the fabric hugs the calves. The front and thighs are relatively smooth, but not tight. The fall edge needs to be finished, but I wanted to make sure it is going high enough. Almost done! Now I only have to sew on the buttons, make button holes, four at the top and three on each ankle. Then I am ready to go! 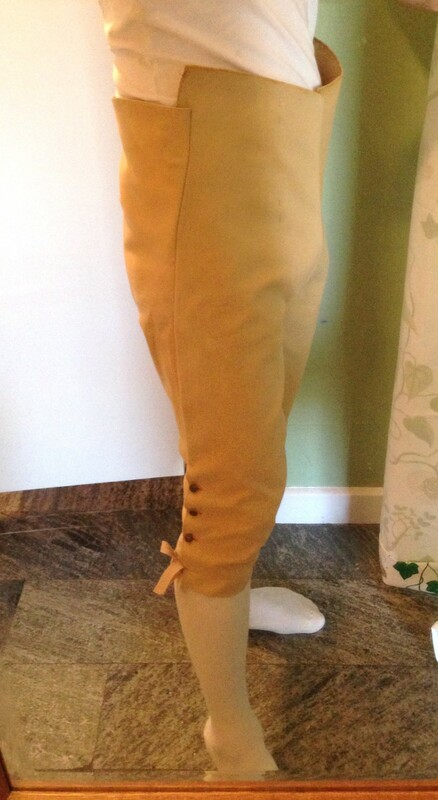 I spent some cool morning hours in the country house finishing the “Faux buckskin breeches”. The process was fairly simple, although the sturdy cotton twill made handstitching rather laboursome. As silly as it sounds, I could only do one seam now and then, and let my delicate fingers rest in between. Things can never be easy, ey? Adding to that we did the improvised photo shoot on the hottest day so far this summer, and – surprise! 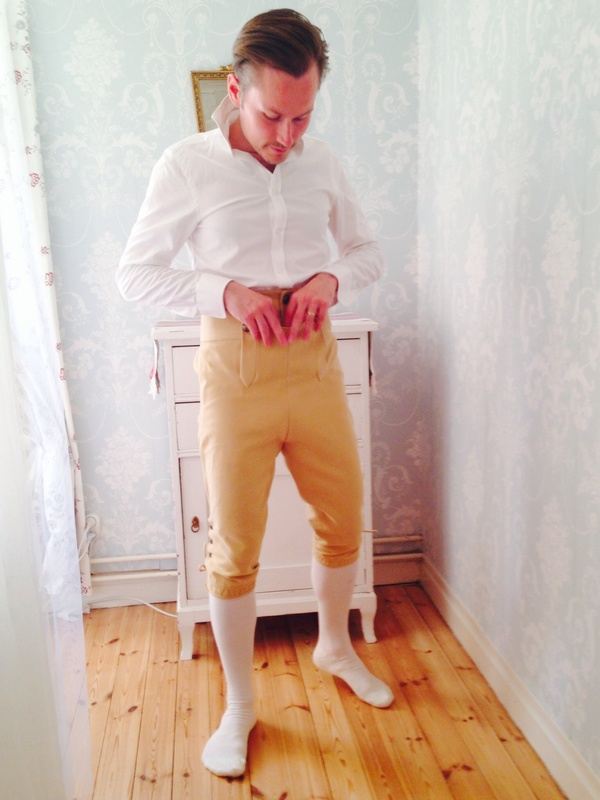 – the close fitting breeches turned out to be rather warm. Try to ignore the modern shirt, as my period shirts and waistcoats are all in town. Managed to bring with me the stockings, though! Read previous posts here, here and here. Close up of the fall front (or front flap) although on appropriate distance. Notice the watch pocket on the waistband. The seat is surprisingly baggy, to enable movement. Notice the tight legs and the waistband made adjustable with the string and gusset. Of course everything will be hidden under the coat. The knee-bands are tied with a double set of strings, made of the cotton twill, rolled and stitched. 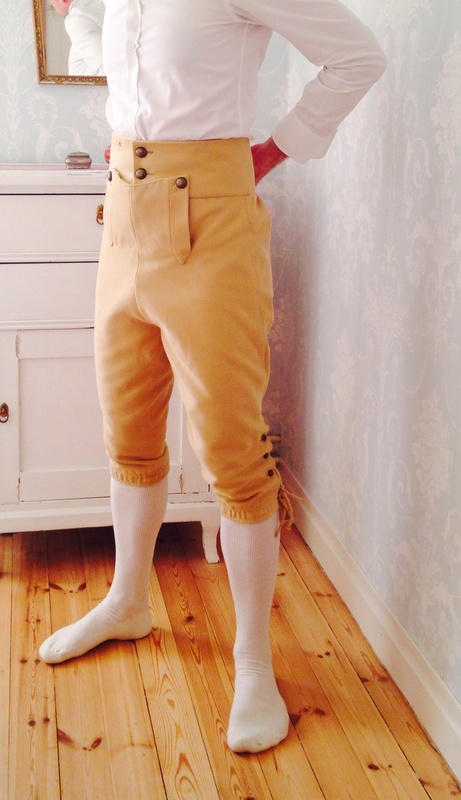 Notice the slightly longer legs on these breeches, a fashion often seen around 1800. A quick post before going to the country (another long weekend over here)! On your request: a closeup of the almost finished fall front and what goes on behind it. Am not wearing them for the sake of propriety. I confess – some machine stitches here and there. Try to ignore the messy inside of the flap, will clean it up soon. The brass buttons are quite heavy, but so is the twill. They are “aged” because I didn’t want polished shiny buttons, and it would be a pain to make covered ones. This weekend I made an effort to finish the kneebands. The side openings on the lower part of the legs have buttons, but the kneebands fasten with ribbons, either sewn on or running through channels. 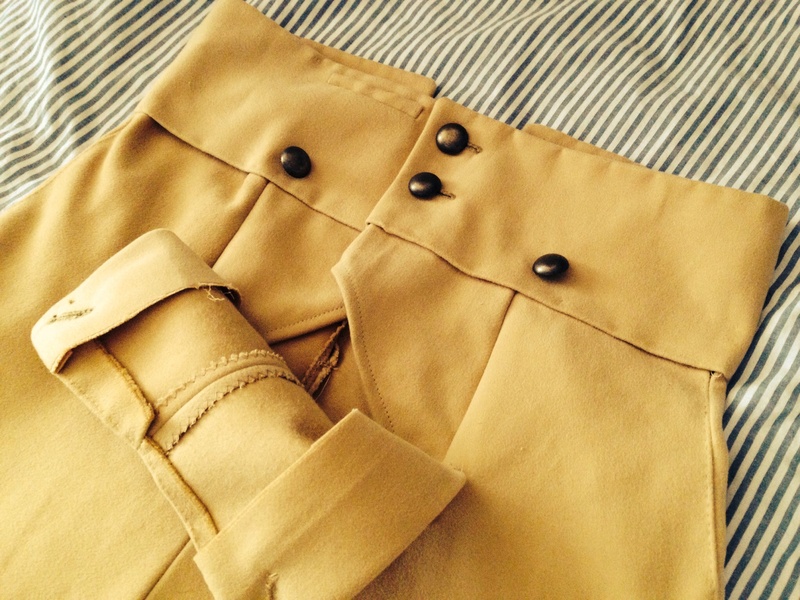 (Could otherwise be buttons or buckles, of course, but not on this style of 1790s-1800 breeches.) See the ribbons on the extant breeches? (An image that always turns up everywhere on the internet, the source is Pemberly.com, but goes back to a page in a book?) These ribbons were tied in decorative bows, see the detail of the Mr Seriziat-portrait. In this way the kneeband would sit firmly below the knee and help to keep the stocking in place. The closeup shows how I backstiched two seams to create channels for the ties. I used some leftover bias tape when fitting, but I need to work out what tape or cord to use. Should be same material as breeches. 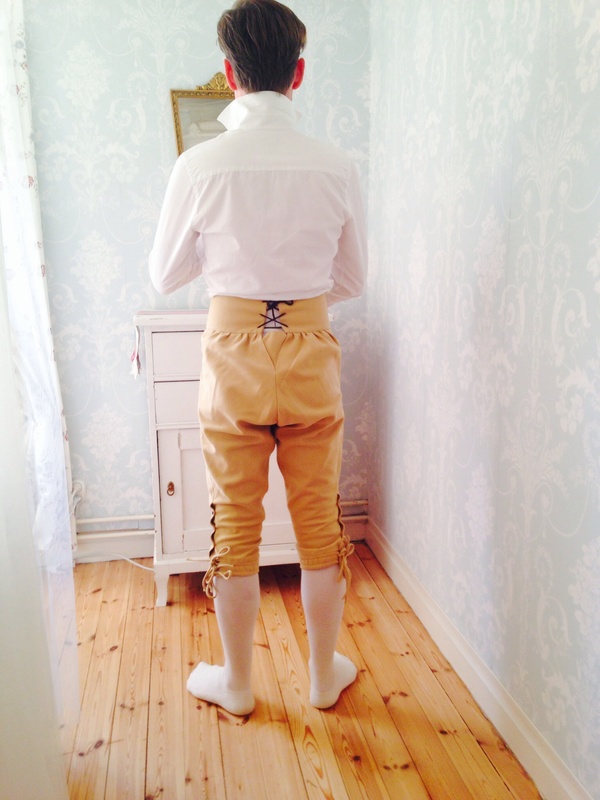 The twill is very bulky though, so rolling and hand stitching it is definitely plan B. I´ll start with the fabric store – perhaps they have suitable tape in same colour as the breeches. How time flies! The social calendar for this spring turned out to be unexpectedly hectic. My appologies. 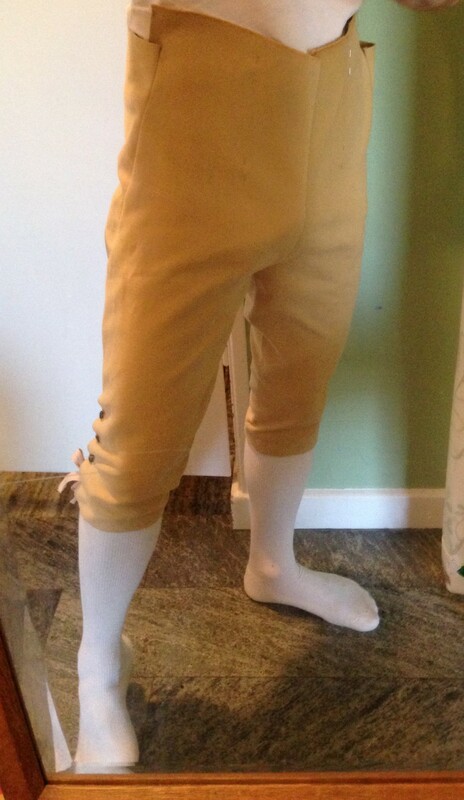 Good news is the breeches are almost done! Here follows a recap of the process. 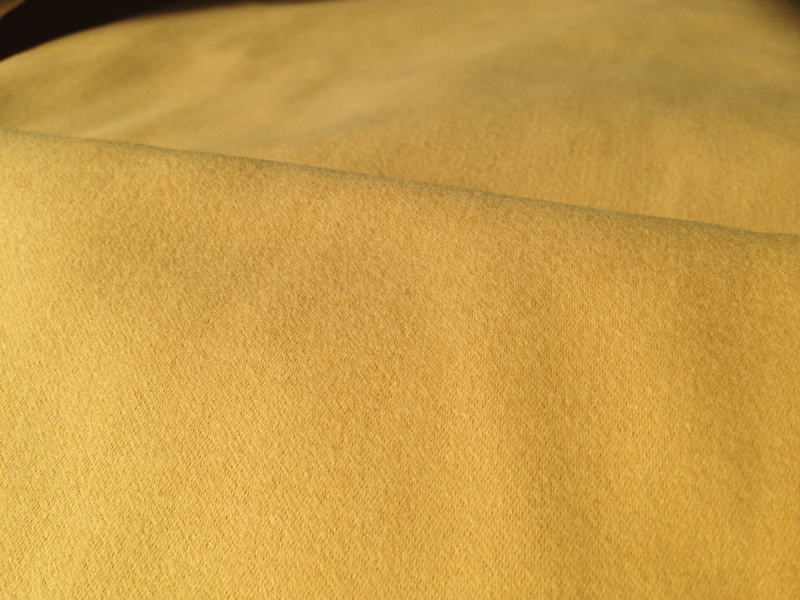 The fabric is a sturdy cotton twill with a brushed surface in a rich yellow colour. Gives the look of buckskin or perhaps period-appropriate nankeen. Fitting the kneeband. Have sewn the buttons and buttonholes. Note that the ribbon is temporary and will be replaced by a narrow strip of the same fabric, or a cotton ribbon in the same or similar colour. 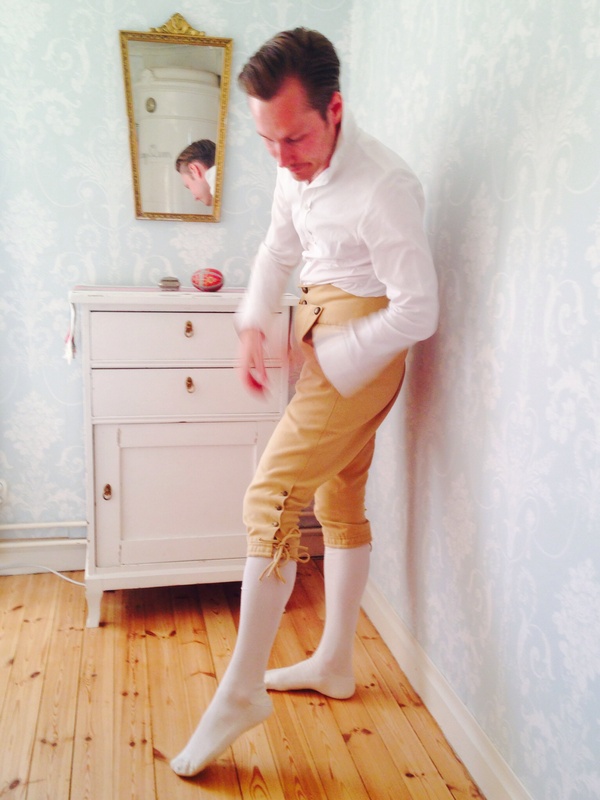 The leg is slightly longer than usual, a fashion trend in the 1790´s-1800´s. A snug fit over the thighs and knees. Somewhat baggy seat. These breeches were the skinny jeans of the day, and are supposed to have the same fit. The front flap is pinned but has yet to be cut. Yesterday I announced the beginning of a new project. My main source of inspiration is the portrait of Monsieur Seriziat by J L David, but this gallery develops the project a little bit further. Since I am not a trained tailor I dread the thought of sewing a coat from scratch. But I´m prepared to try this coat from the years around 1800, late Georgian to early Regency. This style doesn´t have the wide lapels and is cut with a soft curve from center front into the tail. Mr Darcy (“fake Darcy” to some, centre image in the gallery) in the 2005 version of Pride and Prejudice wore a coat of linen or cotton in this style. So did Mr Ferrars in the 2008 Sense and Sensibility (last image). Both versions set the story a little earlier, somewhere around 1795. The local store has a soft green medium weight and reasonably priced wool. Not the best quality but good enough for this project. The colour is perhaps a bit too light – looks better inrl. I could also imagine navy, should they order some. Either version work well with the existing waistcoat in cream-coloured silk (with the buttons on the wrong side, remember!). 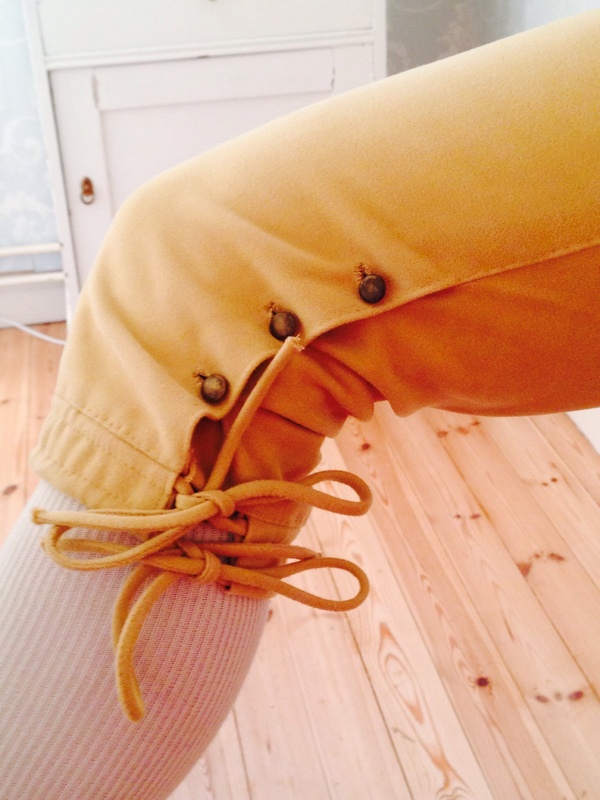 Years ago I found the sturdy yellow cotton (a real bargain at a closing down sale) and my immediate thought was breeches. The right side of the fabric has a very soft surface, reminiscent of “moleskin”, and gives the feeling of buckskin or perhaps nankeen. (Cotton from Nanjing in China.) I will of course use the pattern from last year. (Just realized that the gentlemen in the pictures above wear long pantaloons, but I still prefer breeches.) Boots. I found these tall riding boots online for really no money (£40 – a fraction of what new ones cost). They are well made quality boots from Koenig. I´am hesitating a little by the thought of cutting in the precious leather. However I tried them on twice now and they are very tall. I mean really tall. I can´t bend my legs, and can definitely not reach the ground. 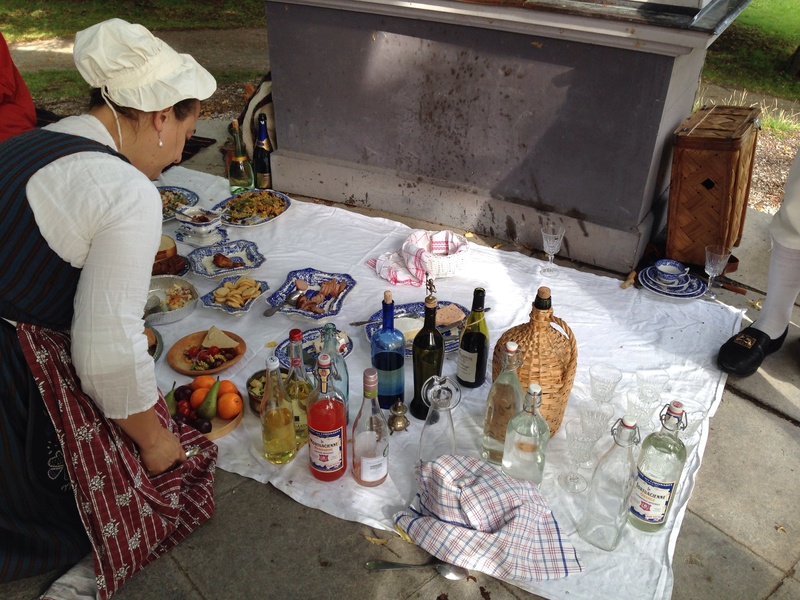 Attending a simple picnic shouldn´t be that challenging! I understand that you are supposed to “brake in” new boots but no way I can do that unless I wear them constantly for a month. Will I go Hessian (b/w image) or hunting boot (bottom row in the middle)? 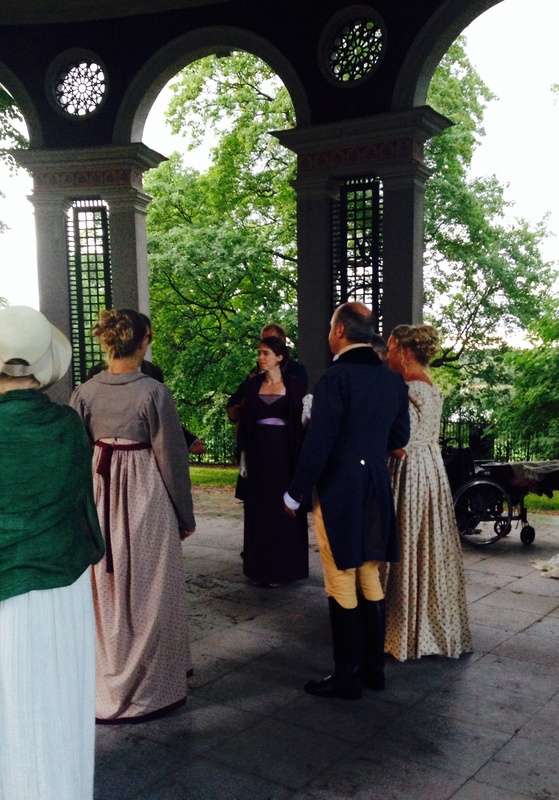 Spring is here and we have set a date for a Regency picnic. I can´t go in full dress, so I need to create something appropriate for this and upcoming outings. First, inspiration for this project. 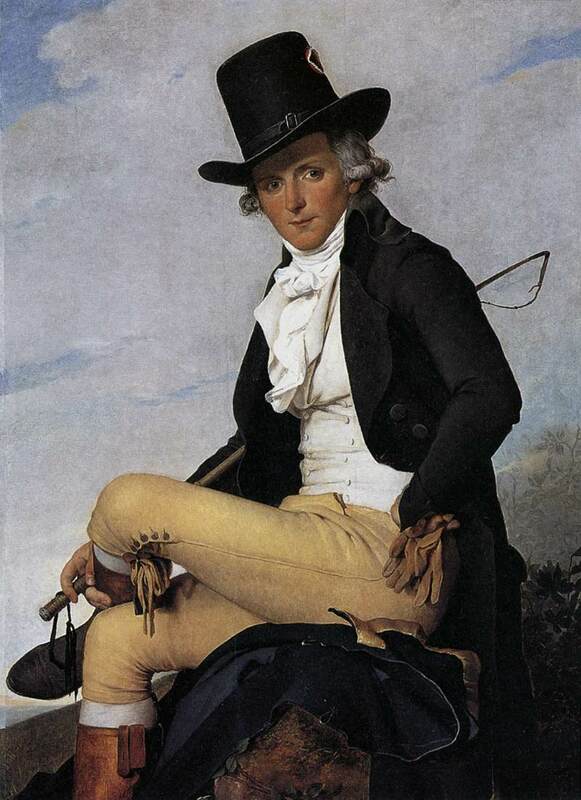 French gentleman 1795, by J L David. 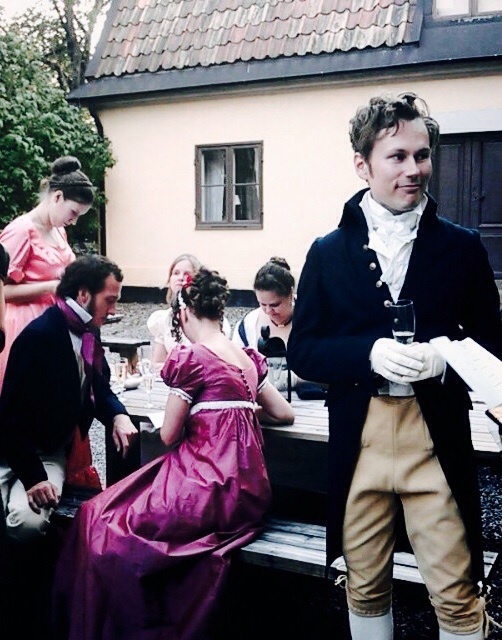 This gentleman´s outfit is in the sporty Style Anglais and can be regarded as the prototype for the Regency gentleman. We have all seen this before: dark tailcoat, high collared waistcoat, yellow breeches, top hat and riding boots. He is still wearing a wig (or his own hair coiffed and powdered?) but it was going out of fashion these years. This transitional style is particularily interesting. Can I do it? Well I´m ready to try. Stay tuned for more details in the next post!